"It's going to be the kickoff to what is essentially several months of us trying to get Washington and the press to refocus on the economy and the struggles that middle-class families are going through, but also for us to start exploring some big and bold ideas," Obama said of his Wednesday speech at Knox College in Illinois, which the White House has promised will return the administration's message to economic issues. 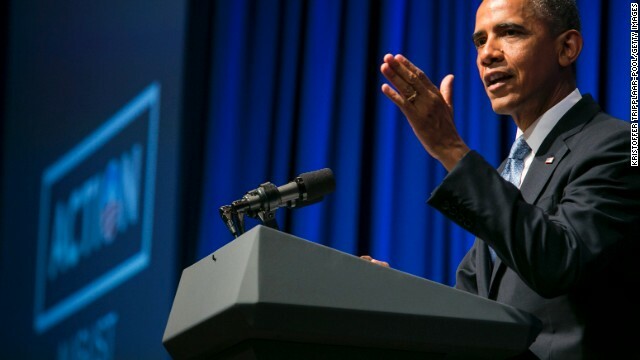 OFA was formed from Obama's campaign organization at the conclusion of last year's presidential election to help promote the president's agenda. One of the non-profit group's biggest assets is its access to the e-mail database compiled by the president's campaign team, which is used to rally supporters around issues and solicit financial contributions. It was evident that money was on Obama’s mind at the event Monday when the president pointed out what a challenge it can be to maintain momentum without major campaign funds. The solution, he suggested, was uniting supporters around issues such as the ones he’ll lay out later this week. "I'm going to talk about where we need to go from here. How we need to put behind us the distractions and the phony debates and nonsense that somehow passes for politics these days and get back to basics," Obama said of his Illinois speech. "Refocus on what it is that everybody is talking about around the kitchen table, what people are talking about day to day with their families." Obama first delivered a major speech on the economy at Knox College in 2005 shortly after he was elected U.S. senator, according to the White House. Obama has similar addresses planned later this week in Missouri and Florida that will also focus on the economy, the issue that continues to rank highest among Americans in polls. Those addresses will launch a monthlong attempt to counter congressional Republicans, who are expected to use the upcoming August recess to blast the president's proposals in their home districts. Comprehensive immigration reform, currently mired in partisan quibbling on Capitol Hill, is set to take top billing in the GOP effort. While an Obama-backed plan was approved by the Senate in June, the measure is currently languishing in the Republican-led House. The White House has underscored the plan's economic benefits, though Republicans have resisted its pathway to citizenship for undocumented immigrants. "Now is the time to get comprehensive immigration reform done," Obama argued Monday. Wary of allowing the momentum to shift in favor of the GOP, members of OFA has organized their own push that will bolster the president's message in individual states. "Action August is about making our voices heard. All throughout the next month, OFA supporters will be speaking up on our top issues - comprehensive immigration reform, preventing gun violence, telling the story of Obamacare, and getting real about combating climate change," OFA's Executive Director Jon Carson wrote in an e-mail to supporters last week. Earlier this month, OFA reported raising $8.2 million in the second quarter of 2013, twice what it raised in the first three months of the year. Obama last spoke at an OFA gathering in January. Speaking before the president Monday, House Democratic Leader Nancy Pelosi spoke to another mission for the group - promoting the issues pushed by the president as a way of bolstering Obama's legacy. "Just think of the legacy that President Obama will have if he has more cooperation in the Congress of the United States," Pelosi, a California Democrat, said. "Cooperation, collaboration, bipartisanship, not obstruction, never 'nothing' which is (the Republicans') agenda." Obama also reminded his supporters that he wouldn't be in the White House forever. "I've got a little over 1,200 days left in office," he said. "I am going to spend every waking minute of every one of those days thinking about and then acting upon any good ideas out there (that) are going to help ordinary Americans succeed." the idea is ready. one of them at least. """Obama also reminded his supporters that he wouldn't be in the White House forever""
"""I've got a little over 1,200 days left in office," he said. Translation : "" I'm a Lame Duck" and in the next 1,200 days, I will be going in a "kick back" mode. I'm going to have the white house chefs fix me & my wife a porter house every other nite, and a filet on the other nites, for supper, and my 2 kids will have banana splits every nite of the week, and I also will invite my friends over to the white house, to play basketball, go swimming, shoot pool, and go bowling. Sure the Administration should design other strategies to achieve this. This method has been tried & it failed.......it is equally expensive . its amazing the time we are wasting not to rebuild our country because of repubs blockage in congress. everywhere else is modernizing at break neck speed, but we are here looking at the crumbling down demise of our country's infrastructure, just because one party is blocking progress. we might not have the steam to catch up with the Chinese on their quest to have the most modern country on the planet, and with an accomplishment as that, they will pull businesses and jobs away from Amerindians even faster than what is taking place now. If you vote Republican, you are a brainwashed Fox "news" zombie, voting against your own best interests. Do some research, you might learn something! Ohhh... Boy... Ohhh... BOY... !!! !!! !!! ANOTHER speech by DEAR LEADER on the economy ! ALL of america can be like DETROIT !!! We don't have a billon dollars for jobs but we can give away 9 billion for Africa. That's just great. Maybe we should stop spending money we don't have period. If we don't have it in our households we do without. It's time for the government to do the same.